It would be an understatement to say the urban lifestyle is sedentary. Spending hours in a chair staring at a computer, not getting enough exercise and watching television while curled up on the sofa are among the many tendencies that have contributed to making back pain one of the most common chronic ailments of our time. "Spinal health is crucial for the wellbeing of an individual,'' says Dr Eslam Khan, a Vancouver, Canada-based postgraduate in Orthopaedic Medicine. Dr Khan was in Abu Dhabi recently to offer his services to patients and doctors at a clinic that offers a therapy developed by him to treat people with spinal conditions. The spine is like a central scaffolding for the rest of the body, he says. The skull, ribs, pelvis and limbs are attached to it. Therefore, ensuring that it is in prime condition is crucial for the health of a person, says the doctor, who is a specialist in spinal disorders. It was in 1997, while pursuing his PhD, that Dr Khan came across an article that described how sound waves were used in times of war to damage internal organs of the human body without any superficial visible damage. "This led me to believe, if used properly, the same sound waves that had the power to destroy [an organ] could be used as a source of healing." He began to conduct more tests and soon perfected a treatment programme based on sound waves. He found that sound waves could be used to realign and restore the spine's condition to its pre-injury state. "It was truly amazing,'' he recalls. 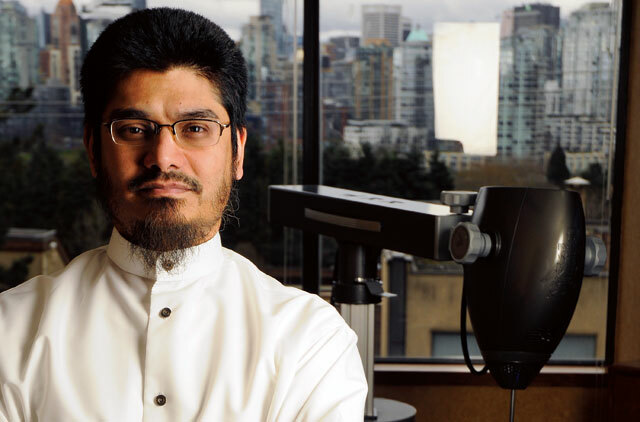 With a specialised team of engineers and scientists - and after conducting tests at major universities in Canada - he pioneered a process of healing which is now known as Khan's Kinetic Treatment (KKT). The idea, design, research and development of the device was carried out under the direction of Dr Khan. Working with a group of engineers and scientists it took Dr Khan around ten years to bring KKT to reality. "It was groundbreaking in the fact that nothing like this was ever done in a non-surgical - or for that matter a surgical - procedure," says Dr Khan. 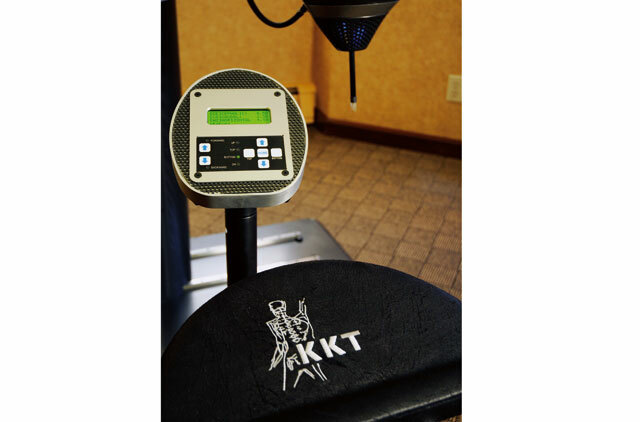 KKT is a treatment system based on using signature sound frequencies that are unique for every patient. It is a non-invasive medical treatment that painlessly realigns the spine and helps regenerate cellular tissue. It can be used to address core spinal distortions and disturbances. Initially, a detailed examination is done for each patient to find out the condition of the spine. The datais then fed into a computer linked to the KKT device. This instrument creates a unique sound frequency for the patient. Upon activation of the device, sound waves of the right frequency are applied to a predetermined region of the spine, resulting in the gentle repositioning of the vertebrae. The waves also stimulate the nerves and blood vessels, improving recovery. The therapy focuses on treating the core issues related to the conditions of the spine that often lead to structural, muscular and neurological imbalances. Returning the spine to its original shape isn't the end of the treatment. With continuing treatment, joints, ligaments and muscles are strengthened. Once a patient is fully rehabilitated, ongoing care is essential for the optimal efficiency of the spinal column. Dr Khan claims a success rate of above 85 per cent. KKT has obtained approval from the US Food and Drug Administration, Health Canada and the State Food and the Drug Administration of China, among others. KKT centres are currently located in Canada, Germany and Taiwan and more centres are being established in India, Pakistan and Bangladesh. The first UAE clinic offering the KKT treatment opened in Abu Dhabi in 2007. Steve Dando, chief operating officer of KKT - UAE, rates the level of response as excellent. "We have an average of 1,000 patients a year. A patient would need 20 to 30 sessions. Dr Khan visits the clinic at least four times a year to offer his services," says Dando. The second KKT clinic opened in Sharjah in November last year. Ummer Sherief, president and CEO of Avicenna Global, the company propagating the KKT clinics worldwide, was himself a chronic back pain sufferer. "I had begun to accept it as my fate. But the KKT system of treatment completely eliminated my problem," he says. He is not alone. Sumayya Abooty, a 46-year-old homemaker based in Abu Dhabi, has also found relief from the severe neck pain she had been suffering from for the past 15 years. It had also led to another condition called ‘frozen shoulder'. "I spent many a sleepless night due to this," she says. After a session with Dr Khan she began to notice some relief. He found that she had developed the condition due to the slight curvature of her neck. She reports that after one month of the KKT treatment her neck is now fully cured, but the shoulder issue still needs a few more sessions. The key to good spinal health is to have a thorough and proper spinal exam at the earliest opportunity, says Dr Khan. He suggests people have routine spinal check-ups just as they would have blood or cardio tests done. For Khan the most gratifying feeling is when strangers who have been suffering from severe back/spine conditions come up to him and say how, after the treatment, they have managed to return to the lifestyle they led before having back pain. One such patient was, herself, a doctor. Dr JE Jan, a Canadian, had chronic neck pain for 12 years. Tests revealed that it was due to the curvature of the cervical spine. "My neck discomfort often led to migraine attacks,'' recalls Dr Jan in a testimonial given to Dr Khan. "I was unable to sit in one position for more than a few minutes, and I had great difficulty sleeping. I tried various medications, physiotherapy and special exercises, but the pain only worsened. It reached a point where I was contemplating retirement as a physician," she says. It was then she approached the clinic in Canada. After undergoing KKT treatment, the doctor says she is back to her old lifestyle - she can now watch TV seated on a sofa, she experiences little pain while travelling and she can sleep comfortably without having to resort to painkillers. Another testimony Dr Khan offers is of a Canadian patient named Doug Rue who had severe back pain following a motor accident in 1991. "My mobility was weakened and I was in terrible pain every time I lifted my arms above my shoulders,'' he says. But in 2002 following a few sessions of KKT in Canada, my life changed. I now fully appreciate how wonderful it is to be healthy.'' he says.